Ten years ago: mom and dad are getting ready for their first open water dive. This wasn't our first diving experience, we'd done an introductory course in Bonaire which had sufficiently piqued our interest in the sport. So when we got back home, we signed up for the full certification class. You can't tell from the pictures, but it was a miserable day. Cold, wet, and choppy water conditions. They'd lumped our class together with another group so we sat in 40 feet of water, teeth chattering, while the instructor went through the drills, person by person. I don't think I've ever been colder. 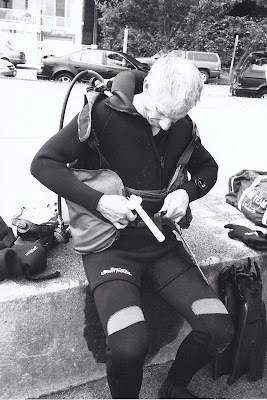 It had an impact: I've only been on diving adventures on two other occasions in Puget Sound's chilly waters. All of our other dives have been in slightly warms climates that don't require 6 mm wetsuits. But frankly, that's a shame: Puget Sound has some incredible sights and one of my most memorable diving experiences was an encounter with a giant (and I mean GIANT) octopus. Lesson learned: Sonja doesn't do well in cold water. 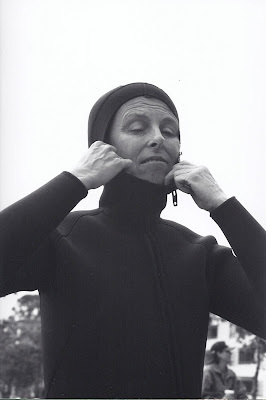 Solution: Buy a dry suit.